With the success of Grant Morrison's JLA in the late 1990s, Justice League comics got serious, a far cry from the Keith Giffen/J. M. DeMatteis Justice League International super-comedy of the 1980s. In between those two extremes, however, had been a short, cogent Justice League run by Dan Jurgens in early 1990s, which combined humor with action and notably connected with the famous "Death of Superman" storyline. Jurgens therefore approaches the DC New 52 Justice League International: The Signal Masters with some level of experience and prior success, as does artist Aaron Lopresti, who just drew Justice League: Generation Lost, the virtual "old" DC Universe precursor to Justice League International. What humor is contained in International, some might mistake for a lack of sophistication, but indeed the book has a nostalgic charm in the vein of the older Justice League stories. More's the pity that Justice League International is cancelled after the next volume, but hopefully Jurgens will show up elsewhere on the DC Comics line with these characters in tow. As opposed to the DC New 52 Justice League: Origin, in which the Big Seven Justice League meet, coalesce into a team almost immediately, and then take out the New God Darkseid, the Justice League International bicker their way through their first two issues and then ultimately retreat from the earth-churning giant robots they encounter. This doesn't seem much the premise of a super-team to follow, but the appeal of this League's characters -- Booster Gold, Green Lantern Guy Gardner, Fire, Ice, and Rocket Red in the "old" DC Universe's International, among others -- is their status as underdogs; Justice League is the team readers would want to be on, and JLI is the team readers would likely encompass. The team comes together and defeats the villain Peraxxus in the end, of course; when the U.N. threatens to disband them, the heroes support one another and stay together. This pluck, again not quite the same as what one gets from the Justice League proper, is endearing to the audience. Jurgens makes a significant decision to not only include Batman in this title, but to lend leader Booster Gold Batman's support. Long-time fans know this is a significant change over International depictions of old, where Batman would barge in, take over, and alienate all of his teammates. At the end of Generation Lost, Booster had earned Batman's trust both by defeating Max Lord and through Booster's secret work preserving the timestream; there's no such reason given here, but Batman's support of Booster again rallies the audience to do the same. Jurgens's characterization of Batman is milder than most, even than that of Batman's depiction in Scott Snyder's excellent Court of Owls and other DC New 52 titles. When Batman asks Guy Garnder to stay with the team because "helping people is what we do," it seems almost quaint, though this Batman is easier to take than the one in Snyder's story who punches his partner Nightwing to make a point. That Gardner and Batman even coexist in relative peace here at all is an item of interest, given their storied rivalry in the classic International (including Batman's "one punch" knockout of Garder). Though those stories no longer "exist," Jurgens takes how the characters have matured since that time as a launching point for a more mature JLI -- still with some humorous in-fighting, but far less outlandish than the International of old. Even as the main plot of Signal Masters has the League fighting an alien threat, the book also sees the League's headquarters bombed by an angry militia, though the source of their anger is tougher to define. The group seems to be upset that the U.N. gives the so-called "Hall of Justice" over to the U.N.-sponsored JLI; the group says the Hall is "theirs" and the JLI are "sell-outs." Without some background as to the role of the Hall, the group's claims don't make sense -- the Hall was a Justice League base in the "old" DC Universe, but if that's the same in the DC New 52, why is it abandoned and why do the protestors feel ownership of it? Jurgens would seem to try to parallel any number of real-world protests, from the Occupy Wall Street movement to arguments over what to build in former World Trade Center areas, but this manifests. 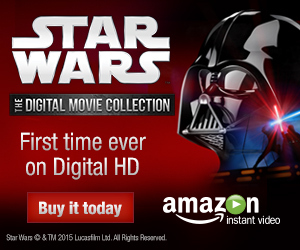 It comes off as the weakest part of a story that has otherwise good characterization throughout. For the first time in the DC New 52 collections, it may be come apparent to readers how much has been lost in the relaunching of DC Comics continuity, even if there's been some requisite gain. Fans will remember Keith Giffen and J. M. DeMatteis's I Can’t Believe It's Not the Justice League, a sequel to their classic International stories, in which Booster, Guy, and Fire venture into Hell to save the deceased Ice, including a heart-rending moment when they might have to leave her behind. The number of issues these characters have appeared in and the amount of continuity baggage they all carry may be daunting to new readers, but it also allows for emotional reading in the amount all the characters care for one another. Jurgens's Leaguers here are friends, and certainly Jurgens is aware of the characters' "old" relationships, but it's not the same as having that history down on the page. This doesn't lessen Signal Masters, but there's an aspect of "getting the band back together" that would have been present in the "old" DC Universe and is not present here. Justice League International: The Signal Masters succeeds in what it does not try to accomplish. This is not a widescreen action book (though Lopresti is no slouch in the action department, as well as expressive faces in scenes of dialogue) nor is it a story of sure-fire, confident heroes. Rather, the JLI is a ragtag group, not sure what they're doing or if they should even be together, comprised of some familiar faces, and fans of these characters won't be disappointed. 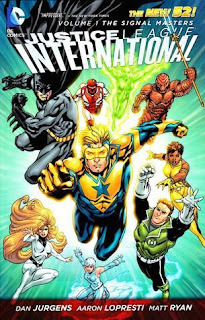 Possibly low sales ended Justice League International after the next volume, or possibly DC Comics has other plans for these characters -- hopefully it's the latter (and failing that, a DC New 52 Booster Gold series by Jurgens!). From DC New 52 team to DC New 52 team -- coming up, the Collected Editions review of the DC New 52 Stormwatch. Even after coming to terms with the realization that they had jettisoned the entire JLI history, I wanted to be into it, but I found the read flat and boring. A hugely disappointing followup (spiritual successor?) to Booster Gold's series and Generation Lost. Helped me realize that DC is just rudderless right now -- tossing continuity is ok if the new stories are interesting and dynamic -- this wasn't. I absolutely enjoyed this series. Unlike Geoff Johns' JL, I felt this series had a forward momentum to the story that kept on getting bigger and better as each as issue went by. And it also helps the art was consistent in each issue. But the sad thing is some comic fans aren't going to give this series a try, cause it "doesn't matter". Before the relaunch, I flagged certain titles as "To Buy". This was one of them, following the enjoyable Generation Lost story, and the equally enjoyable Booster Gold series, and here we had Jurgens from Booster and Lopresti from Gen Lost. Not to mention that I was a huge JLI fan back in the day; that and Batman in the early 90's is what my comics reading centered on, and made me a "DC guy". Unfortunately, I found the first issue "flat and boring" enough that I didn't continue to buy it. Your review seems quite favourable, but considering my initial impression, and the fact that it got cancelled, I don't see much reason to buy it now. That being said, the annual is being co-written by Geoff Johns, and I suspect that there is more on the horizon, so I might at least check that out. I take your points on the "flatness" of this book. Perversely, I think that's one of the reason I liked it; it's not the flash and bang of Justice League: Origin, but rather a more "regular" team book of "not quite ready for primetime" heroes. That they look like Booster Gold, Fire, Ice, and Guy Gardner, even if they're not quite "my" version of the characters, is enough to mitigate some of the lesser aspects of the book and make me eager for another volume -- you're going to find a similar theme in my review of the first Stormwatch book. The stories don't have the same punch as Greg Rucka's first Checkmate volume, for instance, but Jurgens isn't Rucka and neither is Paul Cornell; we wouldn't be getting "comics reinvented" anyway. If I seem to give these books a little leeway, it might be that I'm trying to focus more on what's gained than what's lost with the DC New 52, though at the same time you certainly saw that I gave Green Arrow the hard time it was due. Well CE, I can respect that you're trying to avoid unnecessarily bashing the New 52. There's certainly enough of that going around! It's not that I want to bash it either. I really really wanted to like the new JLI, but that first issue really lost me. Perhaps if I had bought the first trade of each New 52 series (instead of just the #1 issues), I might have gotten a better feel for each series and then made a more educated opinion on whether to keep it up or drop it, but that's way more money than my comics budget allows! I'm still hoping that this series is replaced with something that I will find interesting. Dan Didio has said regarding the cancelled series that the characters aren't just going to disappear (although poor OMAC; first his own series gets cancelled, and he's moved to JLI, only for that to be cancelled! ), so I'm sure we'll continue to see more of these characters. Guy Gardner in at least one of the FOUR Green Lantern titles, and I'm sure Booster Gold is still high profile enough to go somewhere! I've been really enjoying reading JLI, to be honest. I agree that it doesn't have the punch of Justice League by Johns, but it has a different kind of feel to it entirely. If JL is "Superheroes in a realistic setting" kind of thing, put on by Dark Knight and the Marvel Films, then this is a throwback to the 00's kind of books where you can have a woman with manipulative hair save the day and "accidentally" feel up Booster Gold. Scenes like Rocket Red realizing Guy and Ice's conversation is not mission related and giving them privacy felt authentic. Less summer blockbuster and more TV Drama. On it's "cancellation" I feel like DC is actually a retool of the whole team. JLI is selling much better than a bunch of other books, and the elements of OMAC plus the solicits for Captain Atom, Blue Beetle, JLI, and the JLI Annual seem to be building to something together. I enjoy JLI partly because I'm fond of these characters (Booster Gold, Fire, Ice...) since my debut as a comic book fan and I'm sorry it ended (although at this moment we now what it's going to be replaced for and apparently it's for the best). However, since the beginning of the series, I've felt that one of its Achilles heels was that it was UN-sponsored. In a world that isn't so black or white like in the 80's and early 90's, the role of the UN becomes systematically questioned. Not that I think the UN doesn't matter, but in the actual world we see on an almost daily basis its role undermined. And, although comic books shouldn't be too political, it's been the most difficult part to me to try and not to think "why should a team of an international organization that risks becoming irrelevant be taken seriously?"